Honestly, I never thought the day would come where I would have anything good to say about the Russian “liberal” or “democratic” “non-system” opposition but apparently this day has come today. To my surprise, all the leaders of this opposition have so far made very moderate and reasonable statement and all those which I have heard have apparently dismissed the notion that the Kremlin was behind the murder. Now this might be self-evident for most of us, but for the Russian “liberal” or “democratic” “non-system” opposition this is quite a change of tone. Many have even said that this murder was a “provocation” (which in this context means “false flag”!) to destabilize Russia and create a crisis. Even Irina Khakamada, normally a real crackpot, has said that this was either a “provocation” or the action of a small group of extremists. Maybe they are aware that the Russian public will not “buy” it, maybe MH17 was too clearly a false flag, or maybe they simply had a momentary moment of decency, but as far as I know nobody pointed the finger at Putin (okay, somebody somewhere probably did, I am just not aware of it). Again, this is quite remarkable. Everybody, pro and anti Kremlin, agree that it is absolutely essential that this crime be solved. Since I personally believe that this was a US/UK organized false flag, I fully expect that somebody will be found and, as we say in Russian, that the “(trail) end will end in the water” meaning that there will be no proof of western involvement. If fact, even if the FSB *does* come across such proof, the Russians will most likely not make it public but use it behind the scenes. As for those who organized it, they also need somebody to get caught because if nobody ever gets caught, then this looks way too professional, but if a small cell of, say, rabid anti-Semitic nationalists, does get caught, then that exculpates all other possible suspects. Considering that the crime happened 200m away from the Kremlin, and that the city center is laced with cameras, I fully expect an arrest in the next 48 hours, a week max. The bottom line is that in Russia this false flag is already a clear failure, not even the notorious Russian “liberal” or “democratic” “non-system” opposition wants to touch this thing. This is very good news indeed. In the West, of course, this is a different story, the AngloZionist will use that to a max, no doubt here at all. PS: while we are discussing false flags, I often get the question of why Putin does not say that 9/11 was in inside job even though he must know. Well, of course he knows, but ask yourself a simple question: why would he say anything? What would Russia gain from doing this? This would only further demonize him, and Russia, in the eyes of those who believe the official fairy tale and it would do nothing at all for Putin or Russia. As for the fact – they are all out in the open, and have been for a long time, just as the JFK murder or Gladio, 7/7, the Bologna railway station bombing, Charlie-Hebdo and all the rest of them. It is simply not Putin’s job to share info with the western public, his job is to serve the Russian people. Finally, though I personally doubt it, there is some possibility that some Russian security services were involved in the Moscow apartment bombings on 1999 so Putin might want to tread carefully here lest the US retaliates by revealing what they know. Note: the Russian word “provokatsiia” is often translated as “provocation” which is not incorrect as long as you are aware that in Russian “provocation” can mean “false flag”, as it does in this context. Putin is clearly warning about a false flag “sacrifice”. Many thanks to Kristina Rus at Fort Rus for the translation of this material. 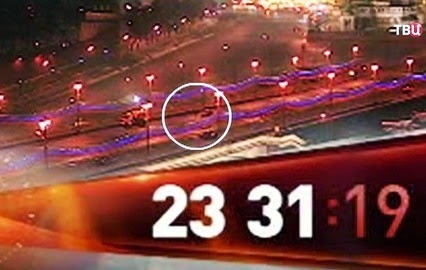 The TVTs TV channel published surveillance camera video which captured the moment of Nemtsov’s murder in the center of Moscow. One can see the car and the silhouettes of people. We can see how Boris Nemtsov and Anna Duritskaya are walking on the bridge toward the Bolotnaya square. They are overtaken and obscured by a snow clearance vehicle with flashing lights. A second later another man runs out from behind the vehicle, gets into a car and leaves. Police arrive at the crime scene at 23:42. We can see two individuals running away from under the bridge. Investigators are considering all possible versions of Nemtsov’s murder. However, Rossiyskaya Gazeta sources in the law enforcement say that they are most interested in the scenario in which Nemtsov was killed for personal reasons. In spite of the fact that Nemtsov was fired at no less than six times, not a single bullet struck his companion Anna Duritskaya. J.Hawk's Comment: That is by far the most plausible explanation of Nemtsov's death. He was mixed up in all manner of shady, immoral, and possibly even illegal interpersonal and financial dealings. He had plenty of opportunity to make enemies for himself, and did not get along especially well with most of the so-called "Russian opposition." Once again, the fact he was shot at 6-8 times at point blank range, out of which only 4 shots hit, and moreover that his companion who was in perfect position to see who was shooting at Nemtsov was left alive and unharmed on the scene, suggests a personal animosity toward Nemtsov somehow related to this "relationship" (for lack of a better word--somehow I doubt the 55-year-old Nemtsov was going to marry the 23-year-old "actress-model) on the part of the shooter. That the US government ordered or inspired the killing is implausible in the extreme. The fact that the USG will use this killing to political advantage certainly suggests cynical opportunism, but nothing more. It is equally extremely implausible the killer was ordered or inspired by anyone within the Russian government. For the sake of completeness, a third set of implausible theories (though here the motive is actually pretty evident) posits that Nemtsov was killed by someone within Russia's "war party" (whose representative or maybe even leader is none other than...Strelkov/Girkin) in order to provoke a harsh Western reaction that would in turn force the Russian government to adopt a harder line toward the West. Still, in the end one has to keep in mind that the vast majority of "contract killings" in Russia have to do not with politics but with dirty financial dealings and/or the underworld. The alternative Anna Duritskaya angle is not that Nemtsov was shot by a jealous lover, but by Duritskaya's pimp. Hello! Are you coming at 1 o'clock? Of course, I am trying to dry my hair. While I was washing my hair, I got called five times. Do you dry your hair in front of the computer? I want to write in your Live Journal, on Facebook, write about the situation with this place, so this scum will stop to... last night they were having fun all night on Twitter, as you know, right? So they stopped squealing already? Bastards, f%ck. Is the scum Chirikova still barking? The scum Chirikova continues to bark along with Limonov. Limonov I don't care about at all. Ok, I am suggesting to write a short post in Live Journal. Can I tell Misha to write that? Why couldn't you convince Chirikova, a chick! Jesus! She is f%cked up, how can I convince her? No, she doesn't want to hear anything. Do you understand the point? At least do you understand it? Those who will come to the Revolution square, for them a passage, a march will be organized to Bolotnaya. They are cretins! They should put up a monument for me instead of Dzerzhinsky on Lubyanka! What? And then steal the archives once again! You are a great Russian writer, can you call Chirikova, and say, Chirikova, b%tch you are insulting Nemtsov, saying he did it for money, did you hear this? This f#cked up b$tch wrote this. Call this rat and tell her to behave! No, she respects you, you are Panechkin, a famous writer, explain the motivation, explain what happened, that I didn't fold, didn't write any letters. You can read in my Live Journal or Facebook, about what happened. They told me the right thing, they said, you cannot fit that many people on that square, and this is true. It's true... And since there will be a lot of people from the office plankton, the internet hamsters, who had never seen a live OMON soldier, I don't want to have any people beaten by bats, that's it! when she wants to help some victims, she calls me, when she needs money for anti-Seliger, she calls me, and then Nemtsov is a traitor, f$ck, is she not a scum? Yashin, f#ck! First of all let me tell you the latest news. First of all we reconciled today with those morons. 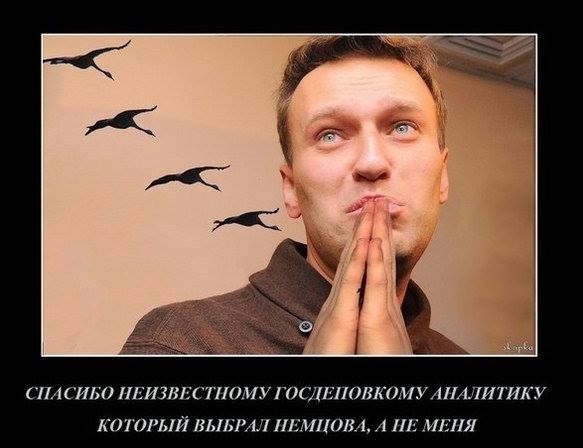 I think, me, Nemtsov thinks. But I need for him to mumble something about this. I understand, but, keep in mind, the situation is the following. Vovochka Ryzhkov wants to go for it. I don't like the idea, because it's not feasible, do you understand? This is not about money. No one will support him. He is, softly speaking, not an optimal candidate. If you will announce him as a candidate for president at the meeting, the reaction will be inadequate. Don't do that. That it's good that you found a compromise, and is very important, that the authorities should carry responsibility for that chaos they started, but don't write, "Don't go to the Revolution square"
Someone told me you wrote this, this is wrong. This is BS. I didn't write this. I wrote... We held consultations all day. As a result I wanted to write a declaration about Bolotnaya, but no one supported me, and we decided to say "Come out and protest" Neutral like that. Borya, we wrote, we need peaceful protests, come out and protest. I know. How many people are coming? But what's your assessment? 10 thousand? You have to come to the Revolution square tomorrow, and lead the people from there. If you come to the Revolution square? I know, tell me the main thing, as far as I understand the only one who separated from you is Limonov, right? Anyone else? 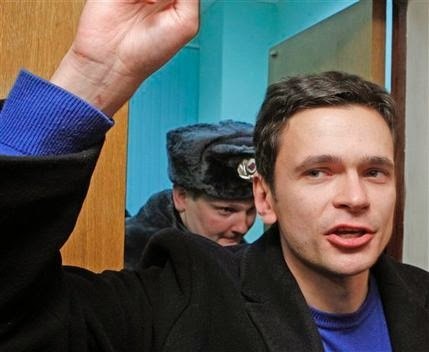 Ilya Yashin is a Russian activist and liberal politician, one of key leaders of political party «RPR-PARNAS», co-founder and one of leaders of political movement Solidarnost. He is also the leader of the Moscow branch of the RPR-PARNAS, in which the Solidarnost participates. In 2005 he was one of founders of civic youth movement Oborona. Active participant of Dissenters' Marches and rallies «For Fair Elections». In 2012 he was elected in Russian Opposition Coordination Council. Olechka, hi, do you know if we got instructions? Have you seen it? Because I didn't get it, I am at home, are they going through Interfax? Understood. Second, about tomorrow, I will come to the Revolution square, and will ask to go to Bolotnaya queitly. Are you coming with me? I think I should be on Bolotnaya, an hour early. I am asking, what do you think? Do you know about the talks at the mayor's office? Did they end? They didn't end. Because if they ended, they would all call me. Were are you, beautiful? And I didn't come, I forgot, where is it? Who is the first one after him? There is an option of Akunin, but the Left front is against him. That's first. Second, what do you think about Alexander Sklar? Fine, but not the first. Not the first, of course. Yes I know, a singer. Has the information field imroved? No longer a traitor, did Chirikova apologize? So she thinks it's fine? I called Oleg Kozyrev, who wrote a horrible post yesterday about a betrayal. I asked him, Oleg, I can understand emotions and negativity, but could you call and ask first before writing? Did he write a better post today? Kristina Rus: this post will be updated, as I continue to translate this long 45 minute recording, which consists of a number of separate conversations, please check back for updates! 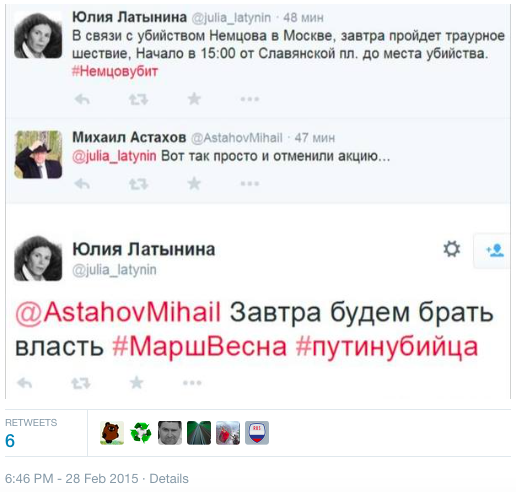 #NEMTSOV - These nuts discredit themselves. "Opposition" journo #Latynina says "we are going to take power tomorrow." #ALL - ABOUT #NEMTSOV. Someone thought he was more useful as a martyr than alive.